The Torch Relay arrived in the beautiful, historic town of Paraty in Rio de Janeiro state on Wednesday, 27 July after bidding farewell to São Paulo. Starting the week with a visit to some of São Paulo’s attractions, the flame visited Beco do Batman, or Batman’s Alley, where graffiti artists have transformed the area. 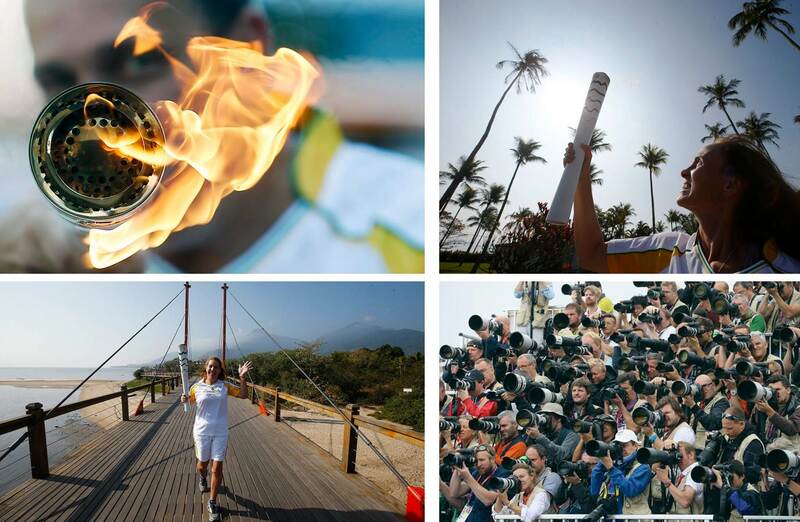 Almost 150 torchbearers, including world champion sprinter and Paralympic medal hope Verônica Hipólito, carried the flame towards São José dos Campos. The torch relay coincided with the town’s 249th anniversary celebrations and ended by lighting an Olympic cauldron in the city park with a special concert by singer Maria Rita. Before reaching Rio on Wednesday afternoon, the flame visited towns close to the state border including Taubaté and Ubatuba. The Olympic Torch Relay, which carried the Olympic flame from Greece to Rio in the two months leading up to the Games involved approximately 12,000 torchbearers. During the Games some 20,000 members of the international media (press and broadcasters) will gather in Rio to help ensure that the drama of the Games reaches every corner of the globe. The Olympic Games are the greatest international sporting event on the planet, and also the oldest, and so, of course, it is essential that the main protagonists – the world’s finest athletes – remain at the very centre of the planning and implementation. Rio 2016, will see a number of significant firsts, with rugby and golf returning to the programme after an absence of many decades, and refugee athletes competing for the first time on the Olympic stage. For the first time in the history of the Olympic Games, fans will be able to ‘enter’ the venues via Google Street View and get a 360-degree view of the stadiums, arenas and pools where the likes of Usain Bolt, LeBron James and Michael Phelps will do their stuff. In the four years since the London 2012 Olympic Games, technology has continued to transform everyday life at a breathtaking pace. At Rio 2016, Olympic sports will harness some of these innovations to enhance the performance of competitors and make the spectator experience more exciting than ever before. Rio 2016 will be the first Olympic Games in which volleyball teams will be able to use video reviews to challenge a referee's call. A second referee will use television footage to verify any challenged points. Replays will be shown on the big screen in the arena while the second referee reviews the challenge, adding to the drama. GPS technology will help fans follow the canoe sprint and rowing events in Rio in more detail than ever before and watch the races in real time on big screens. Thanks to GPS devices attached to every vessel, spectators will be able to see key data such as speed and direction. The system was used in the test event last year at Lagoa Rodrigo de Freitas in southern Rio. Key moments of sporting drama from the Rio 2016 Olympic Games will be shown in full and true 360-degree high-definition virtual reality (VR), offering an unprecedented and immersive view of the action. Using a compatible headset and their mobile phones, viewers will be transported right to the heart of the Olympic action , with coverage slated to include the opening and closing ceremonies, and one event per day. The live broadcasts will be offered via video-on-demand services provided by the various international rights holders, including NBC in the US. So far, 12 rights holders have taken up the VR offerings, with others still to confirm. The OBS is planning 85 hours of VR programming, including the opening and closing ceremonies, men’s basketball - including the semi-finals and final - gymnastics, track and field, beach volleyball, diving, boxing and fencing. With the goal of providing a new way to engage young people, fans and new audiences in the Olympic Movement, the Olympic Channel is a free platform that will present original programming, live sports events, news and highlights offering additional exposure for sports and athletes all year round. Olympic Channel original programming will include both short-form and long-form content, focusing on elite athletes, their quest for success and sport around the world. Designed for a global audience, the Olympic Channel digital platform will showcase content from around the world, and will initially be offered in English. Additional features at launch will include fantastic content as video on demand, as well as individual sport pages within a user-friendly and mobile-responsive interface, subtitled in nine different languages. In this pursuit of innovation, AMP VISUAL TV has built its groundbreaking Millenium Signature 12 (MS12) HD/4K-capable OB van with up to 40 cameras on a Riedel MediorNet real-time media network of unprecedented scale. Due to its modular design and mobile partition system, MS12 can turn into a two-in-one OB truck capable of conducting joint operations with two production areas, two audio mixers, two vision rooms, and up to 42 modular workspaces. AMP VISUAL TV's sophisticated approach completely relies on a robust MediorNet infrastructure — one of Riedel's biggest so far — that offers essential benefits by replacing the traditional router; providing video, audio, data, and intercom transport; and delivering routing and processing capabilities. Imagine Communications has completed more than 25 IP-based customer installations including Disney/ABC, TV Globo, Clark Media and Sky Italia. The milestone, evidence of the long-term and sustainable momentum behind the shift of media operations to IP-based computing and networking platforms, validates Imagine Communications’ pioneering advocacy for the media industry’s transition to a more agile and versatile technology foundation. Imagine Communications is spearheading the transition to next-generation architectures through the design and delivery of products and solutions built for hybrid SDI-IP and pure IP environments that facilitate the management, movement and monetization of media over commercial-off-the-shelf (COTS) environments. PURE LIVE will be published on 28 August prior to IBC! Detailed descriptions of 24 new 4K/UHD OBVans from all around the world: Australia, China, Canada, Europe, United States, in particular AMP VISUAL TV, Arena, Clark Media, Croatel, Dome Productions, Euromedia, Gearhouse, Hunan TV, JSBC, Mediapro, NEP, Telecenic, Timeline\TV, TopVision, TV Skyline, TVN, Videohouse. Portraits of international system integrators, rental facilities and production houses . With 24-hour non-stop programming, 45 cameras lining the edge of the circuit, 52 cameras mounted on board vehicles and a staff of 385 to cater for 35 million viewers, for this event AMP VISUAL TV had quite a lot on its plate! In 2016, the technical systems were orchestrated using AMP VISUAL TV's all-new OB truck. It covers an unusual amount of space (85m2) and has all the power of two units, making for a uniquely comfortable working environment. It can manage two international signal programmes (one for the pit lane, the other for the racetrack itself). This particular 24 Heures du Mans was the 84th in history, but also the most digitalised. The race was enhanced by a special second screen application for which AMP VISUAL TV guaranteed total streaming from 23 sources, some of which were the participating makes' private events. In less than a generation, the video games industry has risen to become even more popular and profitable than the movie business. Online gaming, in particular, has exploded and given rise to Esports: a video over IP platform that sees teams of gamers compete against each other in leagues and tournaments that are broadcast online to audiences of thousands. At the forefront of Esports is ESL, a gaming network with 15 studios around the world that brings gamers, analysts, pundits and fans together to enjoy the excitement of tournaments, competition and big prize money. ESL’s UK studio operations are hidden away on a quiet and inconspicuous industrial park in Leicester. With room for several teams of gamers, commentators and an audience of up to 100 fans, the largest studio broadcasts 3-4 times a week and includes a range of products from Ross Video. Manila Major, one of the biggest gaming Championships in eSports, was delivered using a live solution built around Blackmagic Design product. Each of the four production hubs featured an ATEM 2 M/E Broadcast Studio 4K switcher for localized production, while a centralized switcher and Smart Videohub 40x40 were used to bring the action together. Signal management was monitored and standardized using the Blackmagic MultiView 16 and Teranex Express. The six day tournament, which saw sixteen elite eSports teams battling for a $3,000,000 prize pot, was produced by PGLeSports and takes place at the Mall of Asia Arena, with thousands of spectators at the venue and many more watching sports channels or online. The 28th Samsung Bosphorus Intercontinental Swimming Competition was held in Istanbul on 24 July 2016. The co-ordination and the production of live broadcast of the event in which 2000 swimmers from 70 countries participated was realized by ACTAMEDYA. 12 cameras were used at the finish and start points of Istanbul Bosphorus Strait that connects Europe and Asia, while 2 octocopters (drones) via RF links on boats helped to broadcast the competition in HD quality. 35 team members took part in the production of the 2 hours live signal that was broadcast on Ntvspor live. Crossing four continents, A Head Full of Dreams is a major stadium tour in support of Coldplay's seventh studio album of the same name. The Latin American dates ran from 31 March to 17 April. The European dates - including the band's seminal headlining of the Glastonbury Festival - were from 24 May to 6 July. On 16 July the tour moved to the US, where Chris Martin and his bandmates are playing 22 stadium and arena dates. It continues in December, with six stadium dates in Australia and New Zealand. Coldplay's live shows are renowned for their high production values - requiring a sizeable creative and technical crew. Miles heads up a team of 14 -16, including the spidercam team and Leo Flint, the tour video programmer, who runs the Ai media servers and Barco e2 alongside Miles. HSL supplied lighting, rigging and a Kinesys automation system for the recent European leg of Chris Brown’s “One Hell of a Nite” tour, working for production designer and manager Tom E. Marzullo from Out Of Our Minds Creative Services, LLC. HSL project managers John Slevin and Jordan Hanson co-ordinated everything for the Blackburn UK based rental company and ensured that the production design - created collectively by Tom E with input from Christie Lites’ Robert Roth and Robert Achlimbari from All Access - was supplied with all the lighting, rigging and automation elements it needed. The tour’s technical director Brian Spett who ran video content for the show and lighting director Charles Ford (also the lighting programmer / operator) additionally had their input, while HSL supplied a top crew chiefed by Simon “Piggy” Lynch, to ensure that everything ran as smoothly and seamlessly on the road for a gruelling three and a half week schedule. The company Winkler Multi Media Events in Canton Aargau is one of the leading Swiss event solution providers for multimedia and three-dimensional live communication. They were recently entrusted with providing the equipment for the opening ceremony of the Gotthard Base Tunnel. With a construction period of almost 17 years, and extending to 57 kilometers in length, the world's longest tunnel is regarded as the “Swiss project of the century”, and has attracted many superlatives. The construction, which is seven kilometers longer than the Eurotunnel, is the heart of the new Railway Link through the Alps and connects the cantons of Uri in the north portal Erstfeld in central Switzerland to the south portal in Bodio (Canton Ticino). As a result, the travel time from Zurich to Milan has been reduced by one hour to about 2 hours 40 minutes. The IBC Exhibition covers fifteen halls across the RAI and hosts over 1,600 exhibitors spanning the creation, management and delivery of electronic and media entertainment. Integral to your IBC Experience are a number of specially curated Feature Areas and events. These are hosted throughout the IBC Exhibition and tied into the IBC Conference to enrich your understanding of technologies and trends that are driving the industry. As of today we feature 27 companies and their approach at IBC2016. This list continously will be updated until IBC opens on September 8th in Amsterdam. The first-ever “live” experiments with video assistant referees (VARs) took place in New Jersey, USA, as part of a workshop organised by The IFAB in cooperation with Major League Soccer (MLS) from 19 to 21 July. With around 20 leagues and associations in attendance, the workshop is providing an opportunity for those interested in hosting the IFAB-sanctioned trials over the next two years to see the technology in action at the Red Bull Arena. Competitions in six countries have already confirmed their participation in the experiments, which were approved at The IFAB Annual General Meeting in March 2016, while others still have time to join. Portuguese broadcast audio specialists CLS Audiovisuais, who started using Optocore devices soon after setting out in 2004 have now embraced BroaMan’s versatile Mux22. The company has purchased a system from the company’s territorial dealer Garrett Audiovisuais, installing the 1RU multi-format transmission device in one of their full HD camera and control OB’s in time for the recent Wimbledon Tennis Fortnight. Mux22 series is ideal for OB truck applications. In one rack space it provides every type of signal which is required between the truck and the remote stagebox. Ideal Systems Group has won a tender with Tencent one of the largest Internet companies in the world, to build a ten Camera, 4K, multi-purpose OB truck. The OB truck which was designed and will be built by Ideal Systems uses the latest 4K Grass Valley LDX 86N cameras which were recently released at NAB Show in Las Vegas and are to be fitted with Canon 4K Lenses. The LDX 86N cameras take the LDX86 Series to a new level with native 4K (3840x2160) and native 3G/HD (1920x1080) image capture, using three unique 3840x2160p 4K XensiumHAWK CMOS imagers with DPMUltra (dynamic pixel management) functionality. Kick-off will be with live football transmissions, Sky CEO Carsten Schmidt announced at a press event in Munich. The coverage will probably feature games of the Bundesliga and the UEFA Champions League. Regarding the question whether Sky UHD will also show movies, series, documentaries, concerts and other content, Schmidt responded that Sky stands for variety which would also refer to UHD. “Intense negotiations” were currently underway with rights holders, he added. For reception of Sky UHD, a new Ultra HD-capable Sky+ receiver will be required which will become available in autumn 2016. The channel will be distributed via satellite and cable. Brand new Robycam 4K Live in China! In June 2016 Movicom LLC and Shanghai Lynex Film and Broadcast Service Co., Ltd concluded an agreement stating that Lynex Film becomes an exclusive representative of Movicom in Chinese Mainland, as well as in Hong Kong, Macao, and Tai Wan (Great China Region). As part of the agreement, Lynex Film is responsible for presentation, leasing, selling and promotion of whole range of the Movicom products and solutions. The Agreement has been concluded after delivery of the RobyCam 3D system in China for the permanent operation. RobyСam is an aerial cable system that offers a combination of robotic winches, gyro-stabilized camera heads and advanced algorithms, which allow the camera to follow literally any 3D motion path within the working area.